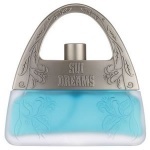 Anna Sui - Sui Dreams Fragrance for Women from Slapiton Beauty. Sui Dreams by Anna Sui is a floral oriental fragrance with a hint of fruit, oriental and marine notes. These include bergamot, tangerine, orange bitter flower, Chinese peony, sandalwood freesia and white flowers. This gives Sui Dreams a fresh, but subtly sweet fragrance. House in a fantastically beautiful handbag shaped bottle, this fragrance aims to take you into the beautiful, fanciful and feminine world of Anna Sui. Anna Sui Dreams is a rich floral oriental perfume that gives a beautiufl and distinctive frgrance to the skin.